NEW YORK: The State of Kuwait is following up with deep concern and distress on the Rohingya plight in Myanmar where the Muslim community is targeted with mounting violence, tantamount to genocides against humanity. 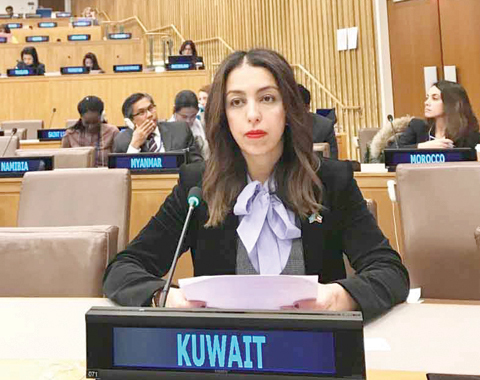 Kuwait affirms necessity of implementing UN recommendations to stop grave breaches of the Rohingya minority’s rights and seeks a broad approach to build peace and provide humanitarian aid for those targeted with persecution, said Hiam Khaled Al-Fassam, an economic researcher, addressing statement of the Kuwaiti permanent mission to the UN commission for social, humanitarian and cultural affairs, during the 72nd session of the UN General Assembly, held late on Monday. Fassam noted that Kuwait took part in the international conference on the Rohingya question, held last week, noting necessity of supporting a draft resolution, presented by the Organization of Islamic Cooperation (OIC) about status of the Muslims in Myanmar. The State of Kuwait considers human rights among its priorities, as they are enshrined in the National Constitution, stipulating equality among citizens and safeguarding basic rights in tandem with the UN Charter and international conventions. Moreover, Fassam elaborated, Kuwait had endorsed international conventions that call for eradicating all forms of indiscrimination, stopping torture, all kinds of inhuman treatment as well as rights of persons of special needs. The Kuwaiti Family Court has issued Law 15/2015 stipulating that a center must be established in each governorate to tackle family disputes and domestic violence. Furthermore, special committees for childcare have been established.